Choices to be made . . . | I wanna love You better whatever it takes . . . Choices to be made . . . 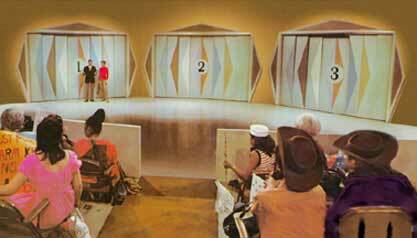 In the iconic television game show The Price is Right Let’s Make a Deal, one of the popular games requires the contestant to select from among three doors. If I am remembering this correctly, the prize behind Door #1 is revealed, and the contestant then needs to decide whether they are going to keep that prize, or risk asking to see what is behind Door #2 or Door #3. What’s behind those other doors could be much better than what is in front of the contestant, or it could be much worse. I have been thinking about doors quite a bit lately as I have been reevaluating my life, because I have seen what’s behind Door #2 and Door #3 (or at least, I have seen a glimpse of each of them), and yet I stand here, hesitating, almost paralyzed by the crushing weight of inertia. I am not happy with my life as it is. I am sure that this is no surprise to anybody who knows me. And for years, I have vacillated, unsure which direction to take. I am annoyingly fickle; it seems like I follow a given passion for a while before discarding it for the next whim or fad that comes along. A few things have remained constant, however, at least on the macro level. I have not outgrown my love for children, or my passion for fighting racism. The desire to have someone to mother is another longing that I have not been able to shake. Over the last few years, desperate for something to change, I have felt a pull to two different doors, each related to these underlying passions. I have taken halting steps towards each of those doors; however, I have yet to make a choice, and I am hyper-aware of the fact that time is passing me by, and that every day of non-decision is a day that brings me closer to being stuck with the crappy-living-room-furniture set that is my current “Door #1”. Behind Door #2 is the “mommy” prize. I have glimpsed into this door, even going so far as to take a few initial foster care licensing classes. My experiences with Elijah have convinced me that I would be able to do the hard work of fostering without any promise of permanency, and I am awestruck at the thought of what a gift and a privilege it would be to be in a hurting child’s life for a season. Am I certain that I could do it? Not at all. But I know that the need is huge, and I do not want to avoid doing something merely because it is difficult. Door #3 holds the “teacher” prize. Having pursued (repeatedly, and unsuccessfully) a particular alternative teacher certification program has been a roller coaster. Certainty that it was going to happen, followed by crushing disappointment. Trying again . . . and again. Still not succeeding, and yet, unable to shake the almost visceral sense that this is what I am meant to do. That feeling ebbs and flows . . . working a temp job grading standardized tests recently, I felt the pull again, “seeing” these students and their need through their essay answers. Who is going to speak for those who have no one to advocate for them? Again, the need is huge, so why not me? I have begun to identify steps that would bring me closer to being able to walk through one or the other of these doors, but I have a long way to go. I am paralyzed by indecision, however, and my greatest fear is that I will continue NOT to act, that I will indeed waste my life. Tomorrow isn’t promised, and my body reminds me daily that I am getting older. If I don’t do something now, I am certain that I will wake up one day an old lady, sitting on that outdated piece of furniture that will daily serve as a reminder of the way that I chose the default option, the “safe” choice that is no choice at all. I believe I was created to live a life that matters. That I am not moving in that direction is a travesty of the worst sort. I need to fling open one of these doors; there is work to be done. I say that I want to live the way my heroes did, but those words ring hollow in the shadow of my inaction. I need to work around the pile of excuses that have held me back for so long. I need to move forward, because life will not wait for me. And the one thing I am certain of is that what is beyond those other doors will enrich my life in ways that I cannot yet fathom. I just pray that I don’t miss it. Raine, just step out on FAITH! God will work it all out for you if you just step out on FAITH! Thus my move to NC….that is all FAITH right there chica.